I was booked to do a two-day session with an artist called Izi Phoenix, who wanted to get his newest batch of 12 songs down. 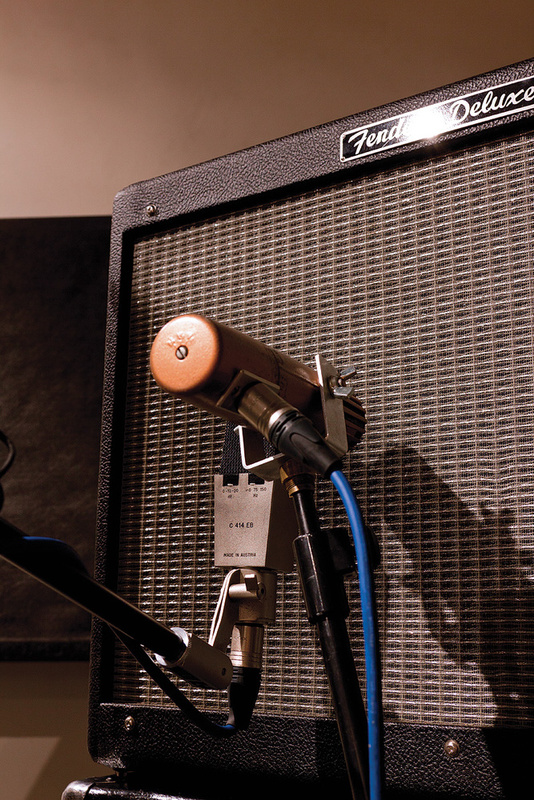 Our engineer tackles the recording of some stripped-down electric guitar and vocal arrangements. We engineers and producers are always searching for new ways in which we can bring some sense of originality to the projects we work on, but many of the decisions we make are actually predetermined to some extent by conventions about what works and what doesn’t in the genre in question. For example, when deciding how to pan things in a typical rock mix, your biggest choices are pretty much always going to be whether to position the drums from the audience’s or the player’s perspective, and whether to hard pan the electric guitars or ‘tuck them in a bit’. But at least in a rock mix there’s usually plenty of other scope for creativity. However, when the project in question involves only very simple and sparse arrangements — featuring only a vocal and an acoustic guitar, for example — our options can feel extremely limited. I’ve run quite a few sessions here at Half Ton that involve a singer-songwriter ‘flying solo’, who wants to present a collection of their new songs to the world. Assuming the performer is up to scratch and the instrument sounds good, the style very often requires nothing more than a simple, nicely tracked guitar and vocal, followed by a modest amount of tinkering at the mix stage. Get good sounds, capture a great performance, choose a nice reverb, and decide if the guitar wants to sit with the vocal bang in the middle of the mix, or be placed just off to one side of it. Job done. There’s absolutely nothing wrong with this approach if the song demands to be presented as simply as possible. But that said, some minimal arrangements are less bound by convention by virtue of the fact that the pairing of instruments is less common, and in such circumstances it seems right to me to try to bring other skills to bear on the production and tease out a slightly more interesting sound. A recent session I ran at Half Ton, involving only vocals and electric guitar, is a case in point. I was booked to do a two-day session with an artist called Izi Phoenix, who wanted to get his newest batch of 12 songs down. He was keen to get the new material recorded quickly so that he could hear which ideas were working well, but he also wanted good enough quality recordings that he’d be able to release small batches of songs on social media, in a drip-feed fashion. Izi also told me that he wanted a sound that remained somewhat ‘true’ to his live shows, in which he sings in a low baritone style along with picked, and sometimes jangly, Jeff Buckley-esque electric guitar. After a little discussion about his influences and where he saw the project going, it seemed to both of us that it would be a good idea to try and tastefully expand his sound. I wouldn’t aim to push any sonic boundaries, but rather to figure out some ways in which I could add some interest, texture and depth to the tracks. I wanted to produce the songs in such a way that, while the production might appear straightforward, the mix would nonetheless discreetly occupy that bit more space between the speakers than it otherwise would, lending the songs an atmospheric feel that would make them more engaging when heard in a longer sitting. The vocal part was tracked using two mics — a ‘safe-bet’ Neumann U87 (nearest) and Coles 4038 ribbon mic. 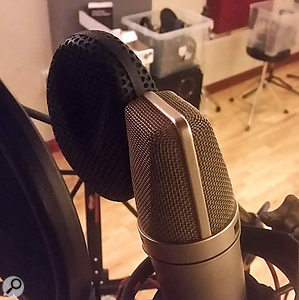 Unusually, both mics’ signals would end up being blended together to create the final vocal sound.To that end, I already had in mind a few techniques to deploy when it came to mixing the tracks, but I was also keen to see what I might be able to achieve at the recording stage. There were to be no overdubs, and no layering of the vocals or guitar. While that obviously limited my options somewhat, it also meant I’d have plenty of ‘sonic space’ to play with. We often end up shaving off many of the lower frequencies from vocal parts in a busy production, but with the luxury of space I was keen to make the most of Izi’s naturally low vocal tone. I find that ribbon mics are really good for this, as the figure-of-eight polar pattern gives you a very strong proximity-effect bass boost, exaggerating the low end. So, while I did put a large-diaphragm condenser mic on the vocal as usual, I rigged a Coles 4038 ribbon mic alongside it to see what it might bring to proceedings. These classic mics are very well known as drum overheads but, amongst other things, they can, on the right singer, also be excellent for vocals. It’s worth mentioning, though, that I’ve learned from bitter experience that you need to take great care when positioning the pop filter, as the 4038 can be incredibly sensitive to sudden blasts of air or changes in singing volume! Listening to both the mics back in my control room, my initial reaction was that I couldn’t believe how nicely in phase the two mics seemed to be. Toggling the polarity of one channel confirmed this first impression, and even though it hadn’t been my initial plan, it occurred to me that blending the signals from the two mics would be a genuine option. 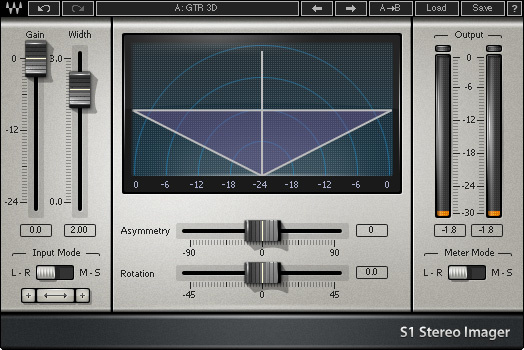 After a little experimentation with the singer’s positioning in relation to the mic, I was pleased with the lows coming off the Coles 4038, and I encouraged these further by applying a little 100Hz shelving boost courtesy of my Audient ASP8024 console. Izi planned to sing and play guitar at the same time, rather than track them separately, so I positioned his amp in a separate room and used my Radial SGI TX box to run a long lead without sacrificing anything by way of signal quality. I also like to capture a DI of the guitar in these ‘minimalist’ sessions, as it can often be fun to try some sort of amp simulation in the mix, and can be useful to have the option of actually re-amping the part. Two guitar-cab mics were used, both to shape the sound and to allow the instrument to be treated as a stereo source at mixdown. I wanted to try a few mic options on Izi’s Fender combo, so I allowed myself to audition four or five different mics. Even in a tracking session like this, though, I don’t want to be left with too many options come mixdown, so I looked to whittle my selection down to two mics for the majority of the session. I tried many of the usual suspects as a close mic, and an old AKG C414EB large-diaphragm capacitor model seemed to be getting the most ‘sparkle’ out of the guitar’s top end. This was important, as I had an overall vision in which a low, rich vocal would be complemented by a brighter-sounding guitar. I wanted more of an ‘effect mic’ to play with as well and, through trial and error, ended up settling on an old RCA BK5B ribbon mic for this. Despite having a limited frequency response, this mic offered a very interesting perspective on the guitar’s mid-range. Before hitting record, I felt it was important that the performer’s cue mix reflected the more atmospheric sound we were heading for with the final product, and with this in mind I spent a little time setting up some reverbs in my DAW, so I could send some to Izi’s headphones. Because I had two vocal mics in play, I felt confident compressing the Coles mic a bit more heavily than I normally would during tracking; I knew I had the other mic as a backup, and I wanted the singer to perform to himself sounding more ‘finished’. Wearing headphones myself at this point, getting the monitoring to sound right took around 20 minutes — and they were minutes that were very well spent! There was little by way of drama once we settled into recording the tracks, and Izi seemed to enjoy performing to the sound we’d begun to develop. The primary challenge for me was setting the right pace for the session, as there were quite a few tracks to get through in a short space of time. I find, from an engineer’s perspective, that you have to work out quite quickly how involved you’re going to get in these short sessions. I tend just to flag up any timing or tuning issues that I think are problematic and not get too engaged with any arrangement or stylistic suggestions. I’ll happily offer opinions if asked, of course, but I like to make the artist feel comfortable and confident enough that they know when a take is good enough. I see my role in these brisker sessions as being more of a sounding board than a producer, and my main job is to make things sound sonically great and appropriate for the genre. Minimal high-pass filtering and compression were needed on the vocals.I’ve already mentioned that I was keen, at the recording stage, to push the natural low end of the vocal and the top end of the electric guitar — I saw this as the top and bottom of the mix, if you will. 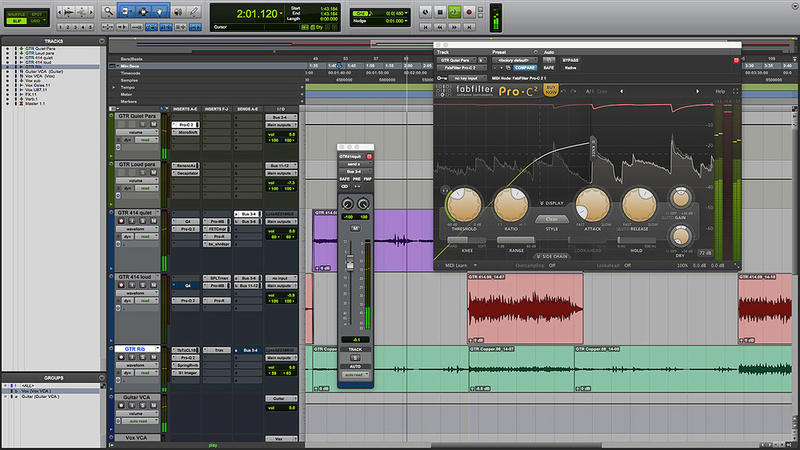 I was also keen, during the mix, to address the left and right; I wanted the sound to have greater stereo width. As I had a number of songs to get through in a modest amount of time, I decided that I’d establish a few techniques that would serve me well generally and then do some bespoke tweaking on a song-by-song basis. The vocal was sounding really good to me, and it felt like the condenser mic was naturally adding a little of the missing top end of the Coles 4038 when I blended things about 60/40 in favour of the ribbon mic. A relatively gentle 4-5 dB of compression on both mics, via a compressor set up on a group bus, was all that was needed to smooth the dynamics out to my satisfaction, and any high-pass filtering I applied was just to clean out any really inaudible lows. I then set up a VCA group for the vocals and used this for riding the volume during different sections of the songs. I could have achieved something similar by automating my vocal group channel, of course, but a VCA enables you to keep the relative levels with any effect sends or parallel processing that you have applied on the individual tracks. 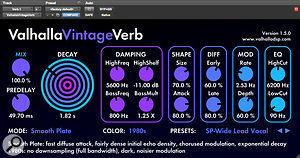 Valhalla’s Vintage Verb was used during tracking for the cue mix and as the main reverb for the vocals.When it came to vocal effects, I found myself wanting to stick, broadly, with the Valhalla Vintage Reverb plug-in patch I’d set up for Izi’s cue mix when tracking. I also set up a few echo effects and a stereo delay, courtesy of Sound Toys’ Echoboy plug-in. With slightly different delay times on either side, this worked really well, as long as I focused the delays on the higher frequencies. By then adjusting the feedback control, I was able to get a nice feeling of ‘spread’, which I was able to exaggerate further via the same company’s Microshift plug-in. 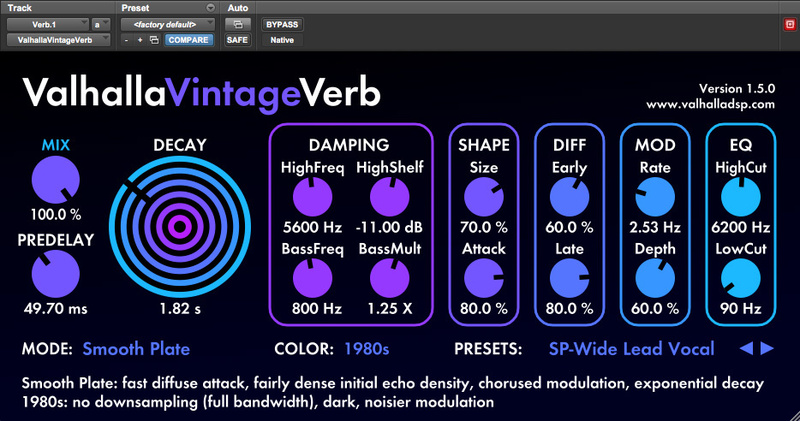 (I really like this plug-in, but there’s definitely a sweet spot to find before things get too ‘chorusey’ for my taste — that’s probably a reaction to my having spent too much time in rehearsal rooms in the ’90s, when everyone seemed to have a chorus pedal on their pedalboar. Regular visitors to my studio quickly become aware of my irrational dislike for this perfectly innocent effect!) 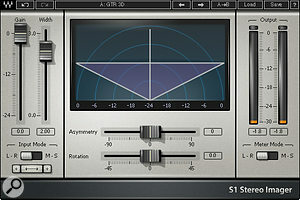 Soundtoys’ Microshift was used to add some extra width to the vocal effects. 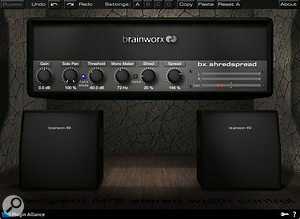 The Brainworx bx_shredspread plug-in helped push the guitars are out even wider on some songs.Although I’d widened the vocal with some of the effects described above, I was actually looking more to the guitar to fill the track out more dramatically. With a few ideas in mind for widening the part, I ran through them to see which might work best. Separating the guitar mics and panning them out wide was an obvious option, and I really liked the sense of stereo spread that this gave me. I thought it sensible, though, to check how this worked in mono and, sure enough, it resulted in a significant change in both the volume and the tone of the guitar. So I tinkered a little and was eventually able to find a spot where it didn’t change the sound too much: by panning the mic signals at 60 percent left/right, the guitar still felt fairly wide but there wasn’t such a dramatic difference between listening in mono and stereo. Waves’ ‘S1 imager’ was used to add a sense of ‘3D’ to the guitars.Both these guitar channels were then routed to a group bus, and here I played with a few stereo-widening tools to see if there was anything more that could usefully be done. 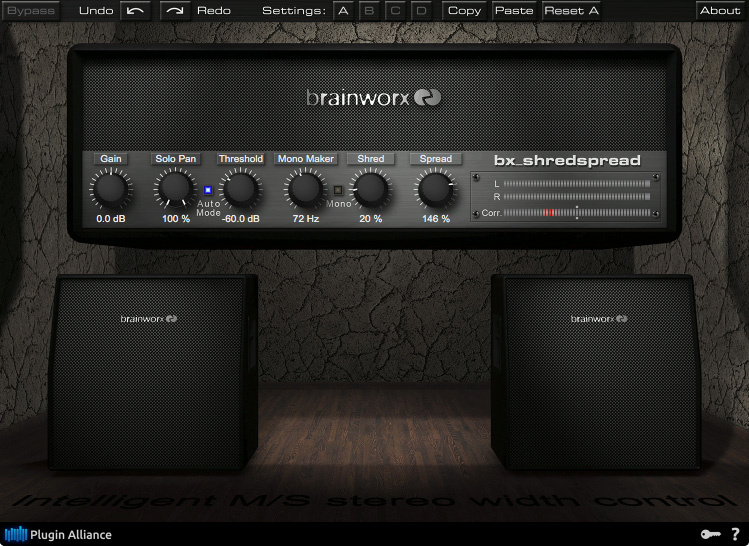 Waves’ S1 Imager rewarded my efforts by contributing a nice sense of three-dimensionality, and the Brainworx bx_shredspread plug-in helped me push the guitar out slightly wider in the mix without any negative mono side-effects. 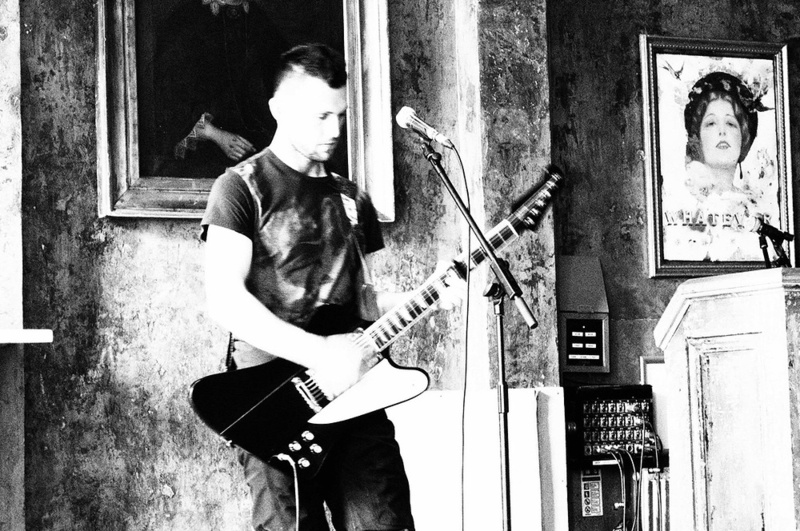 Effects-wise, on the guitar’s AKG C414EB channel, I mainly used the same reverb as I had done on the vocal. On that mid-rangey RCA BK5B ribbon mic, though, I deployed Softube’s spring-reverb emulation to try to achieve a more ‘authentic’ guitar-amp sound. For some of the songs, I was able to use some really long reverbs, which almost became a sort of low-level instrumental part in themselves, and the Fabfilter Pro‑R plug-in did a great job here. On certain songs, the guitar playing was particularly dynamic and this posed a greater challenge when it came to sitting the part where it needed to be in the mix. Often, there would be quite delicate picked guitar parts in the verse, and these would give way to rather louder strumming in the choruses. To complicate matters further, some of the effects I’d created for the picked parts made everything sound too ‘washed out’ when the louder sections kicked in. 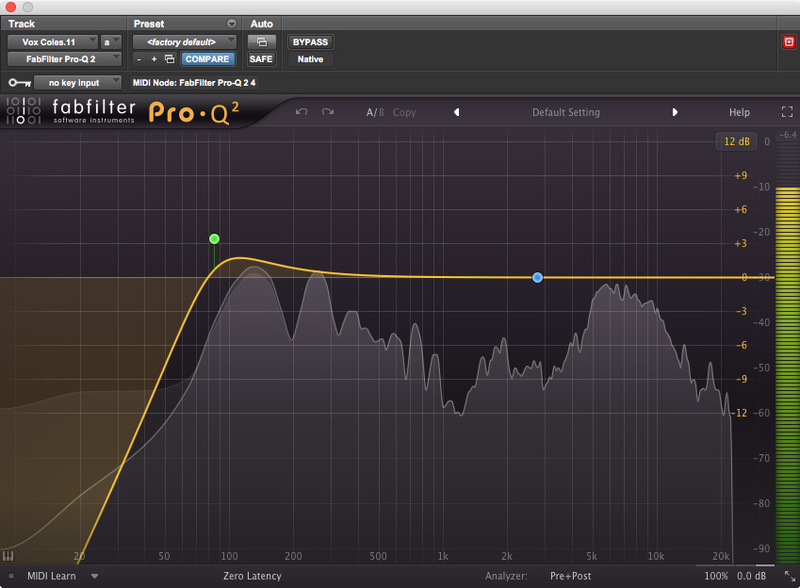 To manage these fluctuations I often ended up splitting the guitar takes out to ‘quiet’ and ‘loud’ channels. This ‘multing’ approach is common enough these days — the idea is to allow you to process the same part differently for different sections of a song, without going overboard with automation — and it worked well here. Having already multed the guitar into ‘quiet’ and ‘loud’ tracks, parallel compression was used to control the guitars’ dynamics as naturally as possible. Using this approach over 12 songs did start to become a bit tedious, as it meant I had to be very careful not to make the sections sound too different, but it was worth the effort and attention. I also used parallel compression on the guitar, as this seemed to control the dynamic without killing it or the guitar’s natural tone. To set this up, I created two auxiliary tracks in Pro Tools and fed them using sends from the two guitar tracks. 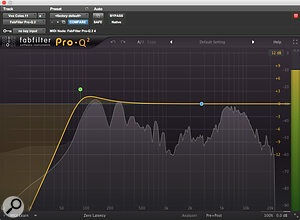 Using one send for the quiet parts and one for the loud ones, I was able to audition the right style of compression for each part of the song very easily. Mixing the vocals was reasonably straightforward, and there was nothing drastically unusual about the processing apart from making the most of the space available in a sparse production. I did this by doing what I could to augment the already nice-sounding bottom end of Izi’s voice, and the Coles 4038 ribbon mic was undoubtedly the biggest factor in helping me achieve this. For the guitar, I think what we accomplished worked really well for most of the songs, even if it had eventually to be dialed back somewhat for other numbers. Unsurprisingly, I think it was on the more atmospheric tracks that my approach met with the greatest success. Over the course of 12 songs, which were mostly recorded over a day and a half, we managed to craft a new sonic environment in which Izi’s songs could sit, without anything feeling too ‘out there’ or being too obviously different from his live performance. Izi seemed pleased with what we’d achieved and we had a good debrief after the session, during which we debated how important it is to stay true to your live sound. I suggested that he might look to introduce some extra instrumentation to his future recordings, and that perhaps it might be needed if he wished to create more of a rounded sound that would have a wider appeal. It’s a balancing act for new and developing artists who don’t have a traditional band behind them, and part of our job as engineers is to (respectfully!) offer some possible routes that people can go down in the studio setting. I discussed at the beginning of this article the unique challenge of mixing sparse material, and it certainly felt like a challenge on this project — at times, it felt like I’d hit a brick wall! When working with only an acoustic guitar and a vocal, it’s a much more straightforward option to mix and present songs in a simple way, and there are undoubtedly solid sonic reasons for this, as well as the fact that we’re just so accustomed to hearing this combination. An electric guitar, though, is usually accompanied by other instruments, and so that familiarity is lacking: with a few notable exceptions, when there’s just a vocal and an electric guitar, it can feel strange, as if there’s something missing. And there’s a limit to what we can bring to the party, by adding effects or trying to extend or control certain frequencies, if we’re not to spoil the song! There are a few current artists doing a great job of taking reasonably traditional songwriting, with minimal instrumentation, and successfully enhancing them with some bold sonic decisions. Two albums I’ve enjoyed listening to this year are the latest offerings by James Blake and Bon Iver. Neither artist is shy about going very heavy with effects such as vocoders and distortion, but this is all interspersed with the more natural sound of guitars, piano and vocals. As with the last four or five Radiohead albums, I find there’s an enormous amount to admire here — but I can’t help craving a bit of normality at times so that I can simply appreciate a great voice or instrument for what it is. This is all part of the ‘art’ of course, and if we’re in the right mood when listening, we can feel like we’re being teased and challenged. Izi Phoenix is a singer-songwriter from the Cambridge (UK) area who regularly plays around East Anglia and London. You can find out more at https://iziphoenix1.bandcamp.com.